March 20, 2019 by Elizabeth Harrin	in technical. With billions of words being published every day, how can you make sure your website stands out? You want potential clients and customers to engage with your content because it helps position you as the go-to expert in that field. In this article I’ll give you an overview of website engagement, share some tips for how to increase engagement on your site, and give you my top strategy for encouraging people to engage with your content. Website engagement is about how people interact with your page. Your most loyal fans and followers are the people who engage most with your content. They are the people who share your articles on their social channels. They download every lead magnet you have on offer. They leave comments. These are the people you want to reach and nurture, because they will ultimately (hopefully) go on to buy from you. They are people who trust you, understand your message and are your idea customer. We build engagement by providing something good enough for people to want, giving them options to engage with us through several different blog income streams. We want to share content with them often enough for them to see it and take action. The ‘Marketing Rule of 7’ is an old-school marketing technique that says people need to hear your message seven times before they take action to buy from you or use your service. In the digital age, it’s theoretically easy to reach seven messages. As bloggers and business owners, we broadcast all the time. You’ve got Pinterest, Twitter, Facebook. You have optimized your site for SEO and your blog articles pop up in search results regularly. Surely your ideal customers are seeing your messages consistently? Unfortunately, that isn’t the case. Your Facebook messages are transient. Scroll past, and you’ll miss it. Plus, Facebook isn’t hugely keen on content that pushes people off of Facebook. Pins last longer, but due to algorithm changes, your best engagement will come from people searching for information, not seeing it passively in their feed. Getting your content to rank in the search engine results is important, but there is still an awful lot of noise on results pages. We’re still chasing the click, even on Google. Ultimately, you want to make sure people not only see your content on social media but click through to your website. And when you’ve got someone to click over to your website, how can you make sure they stay long enough to hear what you’re saying? You can check what your website engagement is like by looking at a few key metrics. Let’s look at how you can check if people are spending time on your website. The bounce rate is how many people leave your website only after visiting one page. In other words, they land on your site, see what it is they came for, and click away. They don’t follow any of your on-page links or interact with any other content on your site. It’s common knowledge that a high bounce rate is bad, and a low bounce rate is good. The lower your bounce rate, the more people are clicking around your site to see other content. You can see your site (and page) bounce rate inside Google Analytics. However, bounce rate isn’t all that. If I come to your site to see a recipe for salted caramel cookies (do you have one? Let me know!) then that’s what I want. Right now I want to bake cookies. I don’t want to navigate around looking at kale chip recipes or slow cooker pulled pork. Give me the cookies. I read the recipe, and screenshot it (because that’s what I do to save it for later, in my recipes photo album) and close your site. I’m happy, and I got what I came for. That being said, as the website owner, it would be nice if you clicked around and maybe subscribed to my weekly recipes. That’s why bounce rate matters: the more clicks on your site, the more content people read, the more likely they are to trust me, engage and ultimately buy my products. There is a lot more to understanding bounce rate – Neil Patel has a great article that explains the concept in detail if you are interested. Another simple way to see how much engagement your content is getting is through time on page. Time on page is exactly what it says: how long someone spends on a page on your site. You can see time on page measures in Google Analytics. Generally, for SEO purposes, the longer they spend on the page the better it is for you. A long page time sends good vibes to search engines because it implies that you found what you were looking for. Short page times signal “I went to the page but it didn’t have what I wanted so I navigated away super fast.” If that’s what search engines are seeing, they won’t send more traffic to you because it doesn’t give searchers what they want. Long page times signal “This content is great, exactly what I wanted and I’m going to read this 2,000 word article right to the end.” That’s the vibe you want your content to be giving off. Plus, if you have ads on your site, time on page is one of the simplest ways to increase the amount of money your blog makes. It’s certainly one of the income streams I am using on my blog. Time on page is one of the easier metrics to improve. The longer someone stays on your site, the more likely they are to engage with your content. Once they’ve read that 2,000 word article, if they love it, they might subscribe to get the latest posts in their inbox. 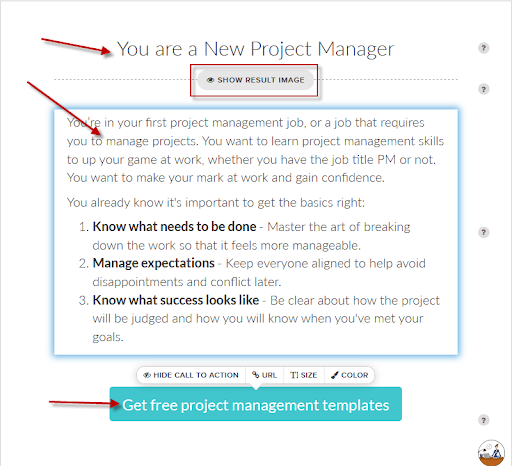 Let’s look at ways to increase time on page now. There are a number of ways you can increase the amount of time someone spends reading your blog content or web pages. I’ll give you an overview of some next and then we’ll dive into one particular strategy that is great for increasing page time. It’s the last point – the quiz – that I’m going to go into detail on. In my experience, quizzes have an almost magnetic quality. 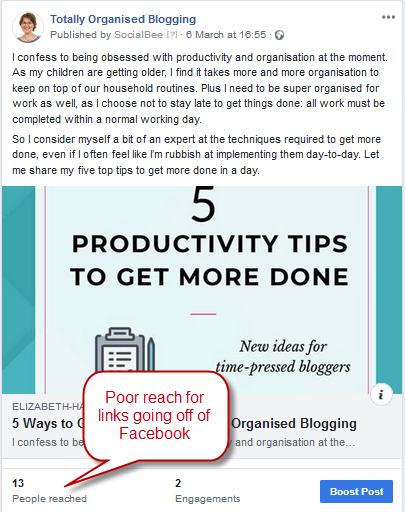 If you embed a quiz in your article (as long as it is relevant to the topic) you’ll find readers can’t help but click through it. Once they’ve clicked through, you can capture email addresses and engage with them on email too (we’re getting closer to the magic number of seven now!). You don’t need much extra time to significantly boost your time on page rankings, so even a quick quiz is great for increasing engagement. Ready to increase engagement on your site? Create a quiz now. Tip: Our goals are to create engagement on the page by making the quiz irresistible to do and to increase time on page. So your quiz needs to be on a relevant topic (so it’s more likely people will do it). However, don’t make the quiz too long. It’s better to get an extra 30 seconds on the page than try to make people do 50 questions and have them navigate away after the first few because you’ve asked for too much. Start short and test! You can always make your next quiz a question longer and see what that does to completion rates. If this is your first quiz, choose the option to use a template. You can fully edit any template, but it saves having to start from a blank screen. If you have more experience with quizzes, feel free to start from scratch if that’s easier for you. Click through the wizard and choose a template. I recommend using a Personality format quiz for your first one, even if you aren’t going to end up with a ‘personality’ answer. 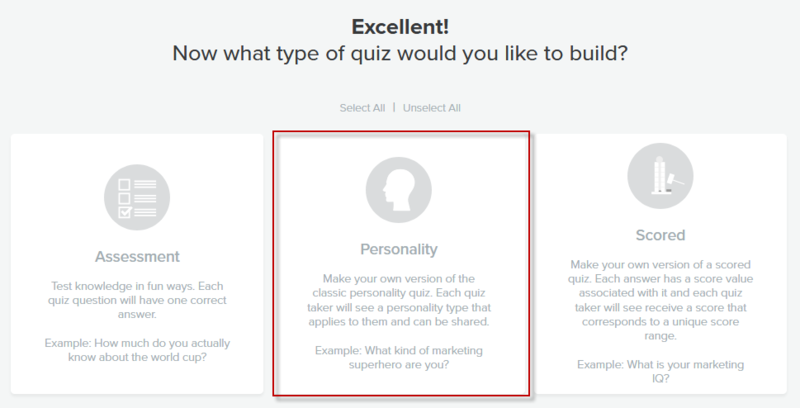 It’s the easiest type of quiz to use to segment people into categories, which is also helpful for adding them to the right mailing list after they have taken the quiz. I recommend choosing one with the same number of questions that you are planning to use. Remember, if this is your first quiz and you are testing out what it will do for your site engagement, I suggest as smaller number of questions to begin with. Review a number of templates and find one that has a good number of questions and closely aligns with how you want your quiz to work. You can see the number of questions in each template under the title. Select the template. Personally, I then add the questions first and get the quiz working how I like, then change the branding, but it’s up to you. In this tutorial, we’re doing the questions first. In the Content tab, edit the quiz title, add a cover image (bright colours are best), add a single one-line description and change the button text if you like. My quiz cover page looks like this. You can see I’ve added my site logo too. You add that in the style section. Next, add your answers. Edit the answers that are already in the quiz template. You can see in the example from my quiz below that I have not used an image in the quiz results. However, feel free to add one. You can edit the title, call to action button and of course the description of the results as the main text. Once all your answers are created, it’s time to focus on the questions that lead readers to your answers. 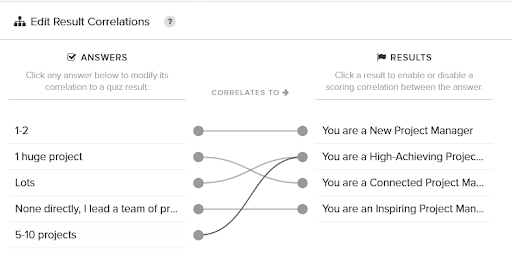 My advice is to plan the questions out before you start entering them, so you know which questions correlate with which answers and whether you are going to use branching logic. In the example from my quiz below, I have used picture responses, but you can easily switch between pictures and text responses. Once you have entered the question, it’s time to add the answers and link the answers to the final result. 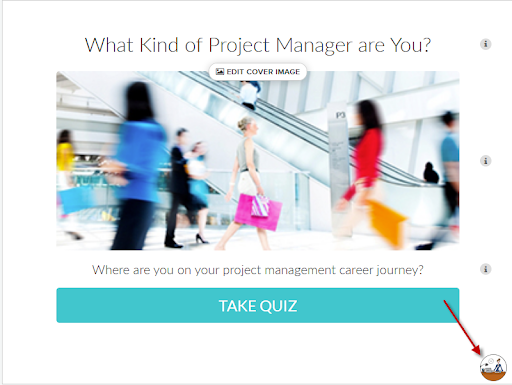 It’s so easy to drag and drop the question responses to the personality type answer. Interact then does the heavy lifting and works out what result the quiz taker should see based on the answers they give to all the questions. Just so you know, this quiz does not use branching logic. You’re almost done. Navigate to the style panel and add in your brand colours. Here is where you add your logo too. Finally, make sure you connect your quiz to your email responder. 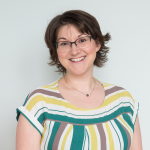 You don’t have to force people to leave their email address to see their results – and I think it is a better user experience if you don’t – but for those who choose to provide an email address, it’s sensible to make sure they can then receive emails from you! 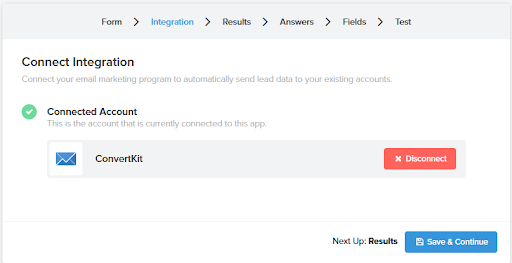 I connect my quiz to ConvertKit, but you can integrate with a number of different email providers. And that’s it! You’ve got a quiz. 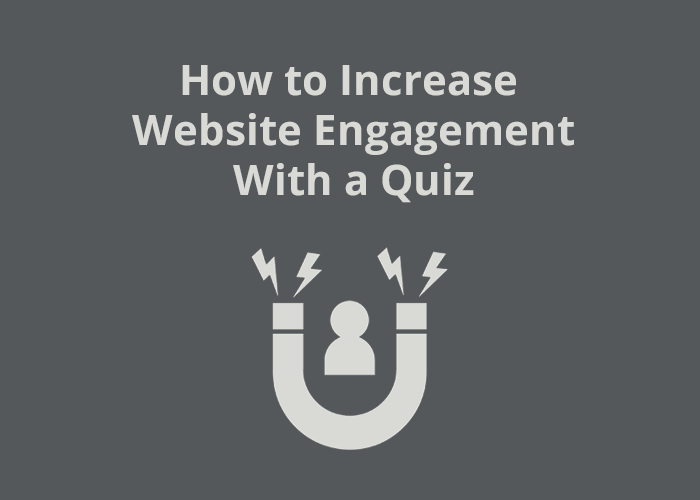 To increase website engagement, you’ve now got to get that quiz embedded in your blog post or on your website. Follow the simple instructions to embed it, and watch engagement and time on page increase!